Winter Forecast Archives - Mor Electric Heating's Blog about home, office & factory comfort heat & freeze protection for pipes & roofs. A Greenland block is now developing which digs cold air into the eastern USA. After the mild winter we just suffered through, when forecasters were mostly in agreement on a brutal winter 2011-2012, a warm winter was caused by the lack of a Greenland blocking high pressure, a positive arctic oscillation, an abnormally cold Stratosphere and many other exceptional issues. Forecasters are in discussion of a much more seasonable winter 2012-2013 with more East Coast storms than normal. So we could see snow and cold starting in November because when Earth comes out of a La Nina it can feature a cold and/or very snowy winter the coming winter or the next. We can only hope for that setup or worse like what happened for the winter of 1976-77 and 1903-04, two of the coldest winters ever. A moderate El Nino pattern is developing which could cause storms to come in through California and cross the southern states on a strong subtropical jet stream which is a pattern that could bring some good winter to the whole country. We need a negative arctic oscillation (very cold air moving south) for storms to move up the East coast with cold air injected into them for a supercharged winter with abundant cold and moisture. Due to the warm temperatures east of the Rockies last season, we had a heating season that was in two parts. The first part was good and the second part was very, very bad. Everything in the heating business was fairly normal into December because people were remembering the past few bad winters. 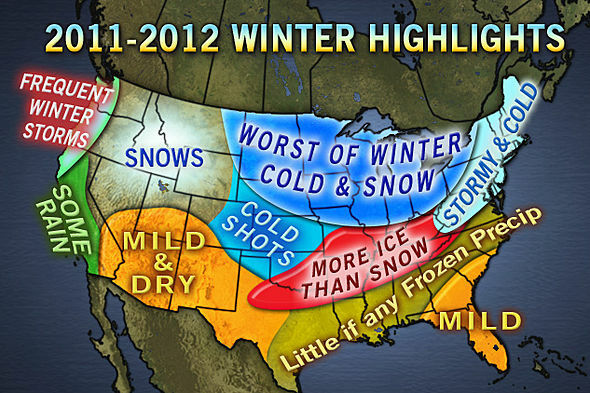 Forecasters are in discussion of a much more brutal winter 2012-2013 with more East Coast storms than normal. A Greenland block is now developing which typically digs cold air into the eastern USA. 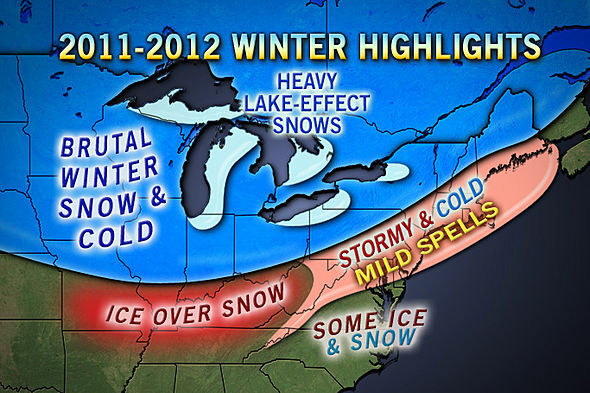 More Predictions of a Brutal 2011-2012 USA Winter: Yet Another Massive Winter Heading for the Northern Hemisphere? Yet Another Massive Winter Heading for the Northern Hemisphere? AccuWeather.com released their winter forecast today. The Midwest and Great Lakes is getting the worst! Hands down, AccuWeather.com’s long-range experts agree that the Midwest and Great Lakes region will be dealt the worst of winter this year. In terms of both snow and cold, this winter is expected to be the worst in Chicago. The AccuWeather.com Long-Range Forecasting Team is predicting another brutally cold and snowy winter for a large part of the country, thanks in large part to La Niña… yet again. La Niña, a phenomenon that occurs when sea surface temperatures across the equatorial central and eastern Pacific are below normal, is what made last year’s winter so awful for the Midwest and Northeast. Monster blizzards virtually shut down the cities of New York and Chicago. Last winter was one of New York City’s snowiest on record. BREAKING: La Nina has begun. The past few bad winters have got people quite upset. Every year people have searched for the term “Winter Forecast” earlier by about 2 weeks. This year was the earliest in the past 7 years and traffic started registering in the Google index as a trending topic since July 1st! Of course, like Mark Twain once said, “Everyone complains about the weather but nobody does a bloody thing to change it!” So, you see, we don’t have much of a choice in the matter, do we? But we do have a choice to prepare for the consequences of the worst weather. In the U.K. the governments are building road salt storage facilities and doubling their stock of salt. And for the first time people are purchasing snow tires and early buy tire programs have been developed. We monitor our own “trends” here at Mor Electric Heating, and I can assure you that “heating cable” is one hot trending topic, even in July and August! We truly feel sorry for all the folks we are talking to that have been thoroughly punished by the scope and scale of the past few winters with another bad one looming. And that is one reason we are committed to becoming (if we are not already) the biggest and best heating cable distributor in the Country! WUWT is saying that La Nina is back already! Temperatures have dropped significantly below the -0.5 deg C threshold of a La Niña and are presently at -0.74 deg C.
Forecast charts take it much colder very soon. La Niña returns | Watts Up With That? He also states that there is “a potentially record breaking US winter for 2011-2012, with extremely cold temperatures and exceptional levels of snow that will see the Pacific Northwest and Eastern US get particularly hard hit”.